Succession is rarely ever clean and tidy. There are always those vying for the throne when they may not have a right to it or those who have a right and don't want it. In The Last Siege #1 from Image Comics, there's a little bit of both. The issue is written by Landry Q. Walker, illustrated by Justin Greenwood, colored by Eric Jones and lettered by Patrick Brosseau. A mysterious stranger arrives at a castle overrun with brutal soldiers bent on usurping the throne of the rightful heir—an 11-year-old girl. It's probably fair to call Walker's script for the issue a slow burn, primarily because it feels like there's really not much happening. Walker introduces the reader to the plights of an 11-year-old heiress to the throne, a macho suitor and a mysterious new stranger all by the end of the first issue and really just leaves it at that. To Walker's credit he does infuse each of the characters with an appropriate amount of personality that befits their stereotypes. Much of Walker's dialogue is presented as a means of getting the characters where they need to be by the end of the issue. Walker definitely has an idea of where he wants the story to go though and it's definitely shaping up to be something grand. Greenwood's linework is very refined and sharp. He manages to give the book an animated quality without making the book feel like an all-ages comic, which is appropriate considering the amount of hand-to-hand combat throughout. His perspective throughout the issue is very powerful in drawing the reader's attention to key moments or facial expressions for example that really help further set the tone. Greenwood also shows things subtly, such as shots of the young princess alone in her room as if to emphasize she doesn't realize the gravity of the events unfolding around her. Jones' colors are gray and moody, going a long way to establish the kingdom under siege as one that's of a different era. The Last Siege #1 is a very slow-paced first issue, but by the end things are definitely heating up. The mysterious new arrival at the kingdom comes with a trick or two up his sleeve, all of which are likely to cause more turmoil than stability. Walker's tale is pretty relaxed and emphasizes a quiet storm. Greenwood does a brilliant job overall and brings an appropriate amount of grit to the work that fits the clearly downtrodden environment. 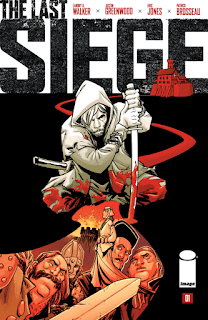 The Last Siege #1 is a good start to a series that will only get more raucous as it unfolds. The Last Siege #1 is available now.